I’ll say it. I have now decided to give myself the title ‘former zookeeper’ because the more I examine zoo’s and the way they operate the less I am satisfied. Most zoos put their animals first, most zoos put most of their animals first, but really, I’ve learned that its a department to department kind of thing. I’ve seen departments who really value and I’ve seen places that are more likely to put the people’s experience before their animals welfare. This photo is from the San Antonio Zoo, the ONLY U.S. 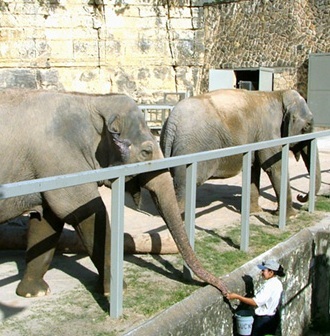 Zoo to make it to the list of top 10 worst zoos in the world. Now, I am by no means saying that the animals I worked with were ever abused or mistreated, guidelines were followed. For those of you who are not aware there are a few different organizations who set the standards, mainly being USDA and AZA(Association of Zoos and Aquariums). USDA requirements tend to be less generous than the AZA guidelines. I’m going to paraphrase some of the guidelines and provide direct quotes at the bottom. For an individual chimpanzee the minimum area the chimp has to be given is about a square room with 6ft long walls. My bedroom is over double the size of a minimum chimp cage. Thats the USDA requirement. Now AZA doesn’t say the minimum for a single chimp, but they want about 2000 square feet of both indoor and outdoor area for 5 chimps. It may sound like a lot, but imagine living in 2000 square feet with 4 other people for your entire 50+ year life. Elephants are a little sketchy, they don’t actually give a minimum requirement, but an elephant can not be kept alone. A night time/holding stall can be no smaller than 400 square feet. There are some very small elephant yards out there. Rhino at the Fort Worth Zoo, this exhibit is notorious for being very easy for the public to stroll in to. 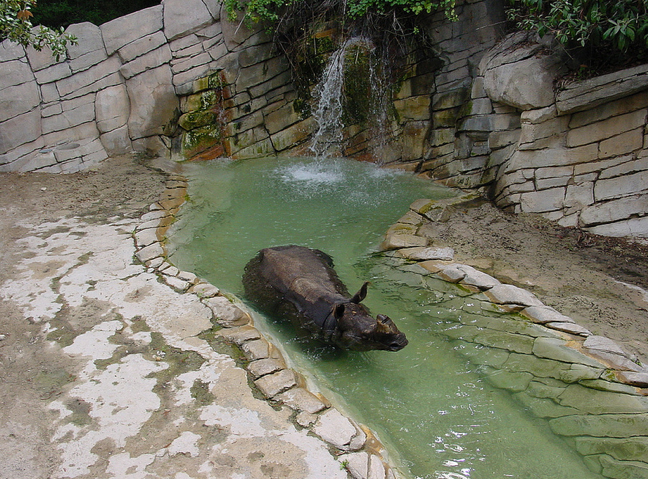 In fact, during my last visit I saw a man wander into the habitat, look at the rhino and walk back out. National Geographic put out a guideline for cats in zoos, it states that lions and tigers should be in something no smaller than 20 x 15 feet. Let’s keep in mind that these are recommendations from famous zoo curators and not legal requirements. So zoo’s that stick to the guidelines seem, in my eyes, to be doing the bare minimum when it comes to animal care. Zoo’s that really care about their animals and not just the cheapest most space-effective way to keep as many cool species as possible will go above and beyond these requirements, even where animal caging is not visible to the public. I’ve decided to focus my further efforts on working at rescues, where animals are sure to come first. The USDA minimum standards for space requirements, for individuals or groups of apes in research facilities that weigh over 55lbs (25kg), are 25.1ft2 (2.33m2) by 84″ (213.36cm) high (AWR 2005). Zoological facilities are required to increase that dimension for any individual weighing more that 100lbs (50kg). As outlined below, more spacious enclosures are recommended. AZA suggests that Small groups (those of 5 or fewer individuals) should be provided with indoor and outdoor space of at least 2000ft2 (185.8m2), and useable vertical heights of over 20′ (6.1m). Minimum recommended stall space (i.e. temporary holding, overnight, etc) is not less than 600 sq ft (56 sq m) for males or females with calves, and not less than 400 sq ft (37 sq m) for females. cages as well as in large outdoor exhibits employing moats to separate animals and public. A cage for a single animal should measure at least 20 ft (6.1 m) wide x 15 ft (4.6 m) deep (300 sq.ft/27.9 sq.m); cages should be 50% larger per additional animal. Shift cages should measure at least 8 ft by 8 ft (2.44 m x 2.44 m). Minimum cage dimensions for single animals should equal at least 200 square feet, and be increased by 50% for each additional animal. As in the case of large pantherids, a shift cage(s) should be available. I didn’t know that the standards in zoos were so low. That’s really sad. Thanks for educating us about this. Many(most U.S.) zoos go above and beyond the standards, some do it in all aspects, some only do it where the exhibit(cage) is visible to the public (i.e. not in behind the scenes holding), and some follow the requirements to a tee. I’m not saying all zoos are terrible with tiny exhibits, but I’m saying we need to educate ourselves and really think about the ones who do not put their animals welfare first.